I have always had trouble dealing with tragedy. On 9/11 my roommate came out of his bedroom and asked me what was going on and I burst out laughing when I told him. He looked at me like I was a total monster. What can I say right now? I'm bad at bringing people comfort and reassurance. I'm even worse at saying the right thing. And I'm positively abysmal at not hiding under all of the blankets on my bed until it passes, using a snorkel to get oxygen so I don't suffocate. So, instead of doing my best to pat you on the back and say "There, there," in a super awkward manner that makes you wonder if I'm actually hitting on you, I wrote you a story about uni-kittens. I recommend putting on some fleece pants and making yourself a nice cup of cocoa before you read it, so that you can enjoy the completely comforting experience. Once upon a time, there were some uni-kittens, and they just happened to live in the heart of the Sparkledarkle Forest. Now, you might be asking yourself a few questions. The first question might be, "What are uni-kittens?" Read the next paragraph. If you already know what uni-kittens are, then skip to the paragraph marked "FOR PEOPLE WHO AREN'T STUPID" and go from there. Uni-kittens are the most magical kittens of all time. Imagine a kitten. 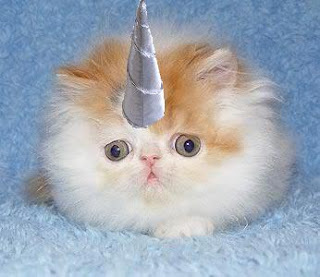 Now imagine that it has the glorious, magical horn of a unicorn poking out of its adorable forehead. Uni-kittens never grow old. They never stop being adorable. And 99.9 percent of them are the happiest, most joyous uni-animals in the land. The unhappy .1 percent is made up entirely of Uglyface, a uni-kitten who accidentally took two semesters of Russian literature one time and never recovered from it. He's kind of cranky. The second question you may be asking yourself is, "Isn't that part of the Sparkledarkle Forest occupied by uni-pandas, the sworn enemies of the uni-kittens?" And I commend you on knowing the geography of Sparkledarkle Forest and for being versed in uni-kitten/uni-panda relations. Now, those of you who asked the first question might now be asking yourselves a few additional questions. The first one might be, "What are uni-pandas?" And I must ask you right now to maybe stop being a complete nimrod and at least try to put two-and-two together and assume that uni-pandas are pandas with the horns of unicorns growing from the centers of their foreheads. The other question you nimrods might be asking is, "Why is Bethany being so mean today?" And it's because I don't deal with tragedy well, so shut your stupid face. In response to the first second question, not to be confused with the second second question, which is actually the fourth question, the uni-kittens and uni-pandas had actually reached a peace agreement, thanks to President Snugglebottom's wisely-appointed Secretary of State, Tickleclaws, and Premier von Panda's wisely-enslaved Secretary of Making Nice, Helmut Frankfurter. 1. Snugglebottom, the President of the Uni-kittens. 3. Tickleclaws, the wisely-appointed Secretary of State in the Snugglebottom administration. 4. Premier von Panda, the supreme leader of the uni-pandas. 5. Helmut Frankfurter, the wisely-enslaved Secretary of Making Nice in the uni-panda regime. Try not to make fun of his name. He's sensitive and will shred you like a piece of uni-bamboo. So, by the time you are reading this story and have sorted out the characters and color-coded them in your mind, the uni-kittens and uni-pandas were living in peace and harmony in the heart of the Sparkledarkle Forest. But peace was not to be maintained because, as you know, there are dark forces at work in the world. In this case, those dark forces were made up entirely of uni-penguins. Now, if you're one of the previously-mentioned nimrods, you're probably asking yourself a single question right now, and that question is, "What are uni-penguins?" And if you are expecting me to answer that question without insulting you at the same time, then you are actually King of the Nimrods. Oddly, King of the Nimrods was also the official title of the leader of the uni-penguins. The uni-kittens and the uni-pandas were preparing for a great feast to celebrate peace between their great nations when the King of the Nimrods waddled into town, accompanied by his accidentally-appointed Secretary of Derp, Norman. 1. King of the Nimrods, leader of the uni-penguins. 2. Norman, the Secretary of Derp, whose role in the uni-penguin monarchy is still unknown. "What are you doing here, King of the Nimrods?" demanded Premier von Panda. "Norman!" said the King of the Nimrods. "Give this stupid uni-panda our list of demands!" "What is this?" demanded Snugglebottom. "We hate peace!" said the King of the Nimrods. "Stop making peace and everyone go strap nuclear warheads to their backs and let's blow Sparkledarkle Forest to smithereens!" "No!" tutted Premier von Panda. "No!" said another uni-kitten whose name I did not catch. "Nein!" said a uni-panda who I think said his name was Rolf, but I don't speak uni-panda so I cannot be sure. Long story short, everyone in town said no to the terrible idea. "Fine then!" said the King of the Nimrods. "We'll just have to do it ourselves." And that was when Uglyface ate him. I lied about him being in the story because I didn't want to ruin the ending for you. The rest of the feast went fine, thanks for asking.